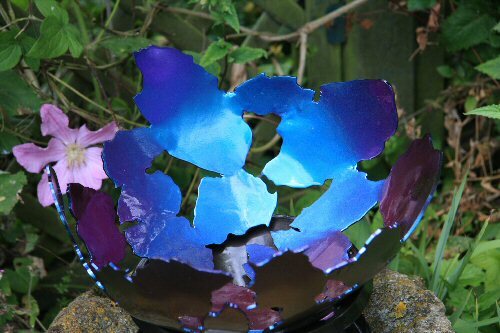 Lincolnshire based sculptor John Glew now has the luxury of time to use skills acquired in industry, coupled with a long held ambition to make sculptural steel pieces. John’s latest work is inspired by the images of strange beauty from the Hubble Space Telescope; recordings of the metamorphosis of galaxies and nebulas; exploding stars which through the passage of time are no more than dust and debris. The fractured abstracted steel shapes, juxtaposed with the iridescence of painted surfaces, suggest a transmutation of base metal into seductive jewel-like objects. John Glew undertakes bespoke commissions for the all the sculptures. His work is currently being exhibited at Union Interiors in Grantham – contemporary interior elements, modern art and interior design.